There is a pervasive desire, at least in the outdoor community, to live an authentic life. Within that culture there is a subculture that has become disillusioned with the American Dream and is leaving corporate life and churches in droves because they are finding that the authentic cannot be found in material wealth or promises of rewards in heaven. The authentic life is lived now, in each moment, in each choice, in the culmination of one’s brief and only life. To find it, more and more are turning to nature to face its landscapes, natural elements, and accept the challenge of surviving the wild essence it has to offer, because it, more than most things, requires an honest assessment of oneself. There is nothing more insightful than testing oneself against nature because it cannot be faked. Stomping the earth with your own two feet and challenging your own endurance, strength, and ability against the elements of nature is the ultimate testing ground for a gut-wrenching dose of reality and adventure, and produces a self-assured authenticity. Knowing you can do it, have done it, is the reward. Sharing those experiences with others is the sustenance that keeps you coming back for more. In order to say, “I did it,” however, one must do it. To get to the top of a mountain, one must hike it. To ascend a wall, one must climb it. To ride a wave, one must surf it. Nature has and always will hold the promise of finding the authentic because one must face it with their own strength and willpower and through it learn to face their fears, possibly overcome them, and discover the depth of their courage, tenacity, and endurance. Many who have lived on that edge accept the advance of time and age and scale it back, having discovered they have what it takes. They have lived and done it and because they know it, they no longer have anything to prove. But some never stop with the answer; rather, the answer becomes the sustenance that fuels and keeps them going. Whether we are among those who seek to find out, testing our courage and strength for the answer or are one of those who lived adventurous lives in our youth and only after taking the risk, discovered how foolish or risky it was, and left it alone – and even if we are in the group of those who never tried – when we see those who are still living on that edge past their prime, we can’t help but watch in wonder, awe, and possibly envy, cheering them on with baited breath, knowing death is ever lurking and hoping they beat the odds. It is this sentiment that leads many to say, “At least she died doing what she loved,” when someone has died suddenly on an adventure in the wild. It does not diminish the loss for those left behind, but it does enable them to experience a sense of catharsis when a life lived at a dead run ends in a manner befitting the person, their life, and their values. It is when people can say that it was a good death, not a senseless death that enables them to understand it, learn from it, and accept it. The acceptance that death is a part of life is a bitter-sweet reality that if taken seriously requires one to define the rules by which they choose to live, knowing that those rules can be their reason, but can also lead to their demise. It is this choice, made with eyes wide open that seemingly so few make, but the few who do, accept with a full knowledge of the inherent risks, dangers, and rewards involved. It is this choice above all others that define us in life and after death, and by which those with the most conviction, solidified by action, earn the respect of their peers in both. Christian Louis Johnson was one such person. He was not a famous athlete and he was not young, but his name is well known in the canyoneering community of southern Utah. 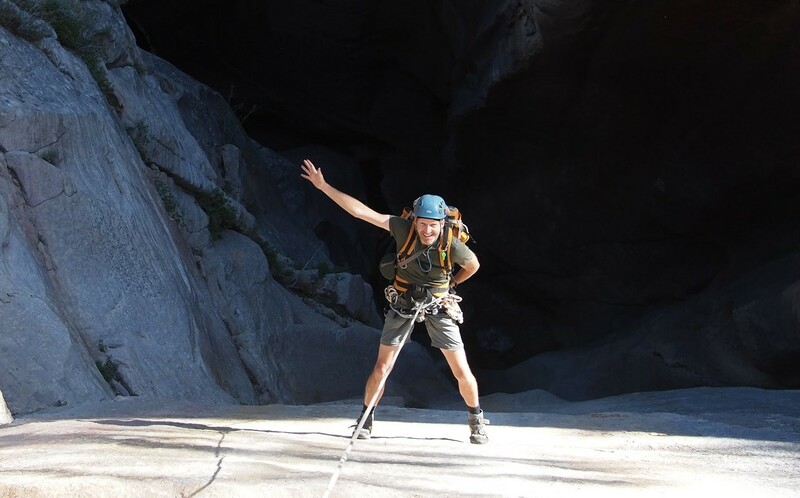 On October 2, 2015 he died falling from a rappel in Zion National Park on the first drop into Not Imlay Canyon. While horrific, it was one of those “good deaths,” and though most of us have accepted the tragic loss, his death has lessons for those left behind – the most important being that nature does not allow much margin for human error, and that while outdoor adventure does require a certain level of fitness, it is a lapse in judgement that is most often fatal. The simple oversights that Louis and his husband Everett made on that fateful day were mistakes that anyone could have made. These men were experienced and safe canyoneers; it was not their lack of experience that left one dead and the other a widower, it was quite literally a couple of oversights that they might not have made if they had slowed down and thought them through. 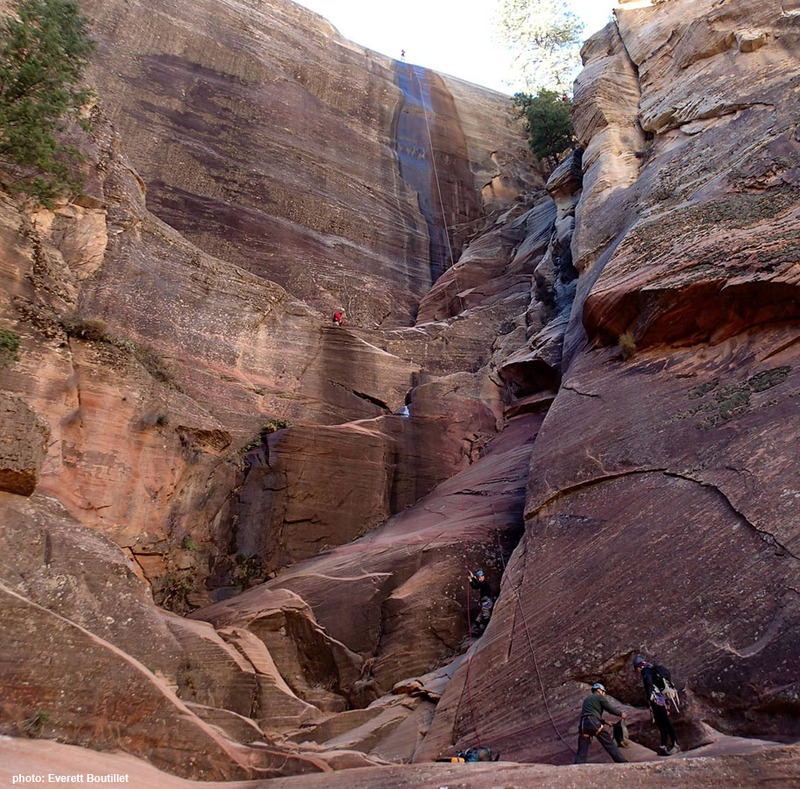 In order to understand what happened the day Louis died one must understand a few things about canyoneering in Zion National Park. The first being that Zion manages the routes in so far as they permit them, allow new routes to be developed, and have search and rescue teams for emergencies. They do not, however, maintain the routes, keep maps of the routes, or provide gear for people venturing into canyons. The beta, or information on the routes, is typically found on the net and provided by guide services. In other words, the park provides the permits but assumes you know where you are going and what you are doing. The second is that while most routes are established and have good beta on them, sometimes anchors are missing or beta changes. You have to be prepared for contingencies. 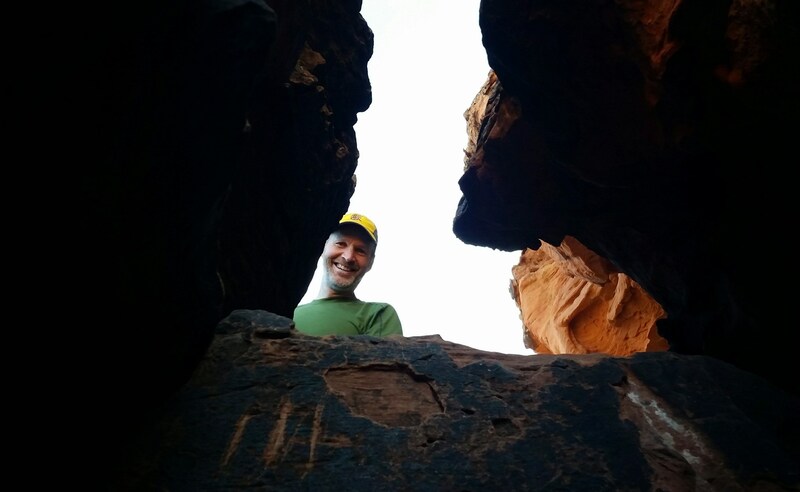 Last year, November 2014, Louis and Everett did Not Imlay Canyon with Tom Jones, the local canyoneering guru, and a few other people on a rope retrieval service project. According to a post on Tom’s blog, the original first two rappels of the canyon were “dirty” and “inelegant.” The original first rappel was done from a tree to the left of the water course down to a sloped ledge where the second rappel was made from another tree. Tom had heard that instead of making the two rappels one could make one clean 300’ rappel to the bottom. They did the 300’ rappel from a tree to the right of the water course. 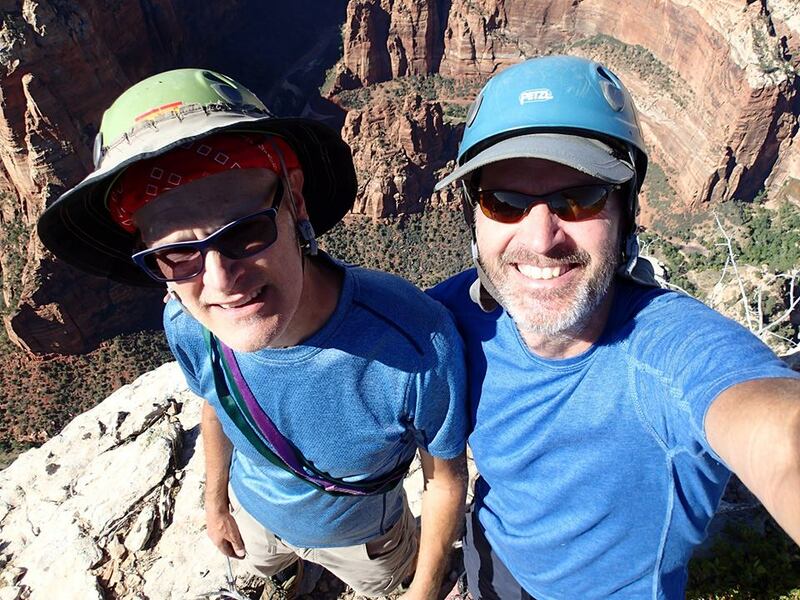 When Louis and Everett prepared to do Not Imlay Canyon in October 2015 they checked the beta provided on the BluuGnome’s website which showed the two original rappels. According to Everett, Louis said Tom did not have beta up on the canyon yet. Clearly he was unaware of the blog post Tom had put up about it. Either way, when they got to the canyon, the sling that had been on the tree to the left of the water course was gone and there was a sling on the new tree to the right for the straight 300’ rappel. To further compound the miscalculation, Louis had their only other 200’ rope on his back, he did not have ascenders, and he had not tied off the ends of the rope. At the point he realized the predicament he was in he either slipped off the end or attempted to land a drop and it turned out to be fatal. He had shouted up that the rope was eight feet short, but according to Everett and to the photo of that rappel sequence, it was probably closer to a 20 foot drop to the nearest ledge. Either way, eight feet or 20′, not being able to land on the nearest ledge and stick led to him falling 180′ to the bottom. In the end, there is no one to blame, only lessons to be learned. ** The beta provided by the BluuGnome was accurate and the day would have turned out differently if a sling had been placed on the right tree. Alternatively, had Louis discovered Tom’s blog post about their trip a year earlier, one can assume with a level of certainty that his memory would have been jogged and they would have prepared for the 300’ rappel. As it stands, forgetfulness, simple mistakes, and plain bad luck led to the events of that day. But in the aftermath of this horrible tragedy something remarkable was revealed. The web that made up the life of these two men became clear through the lives touched and impacted by them like a spider web covered in water droplets, and what surfaced through everyone’s stories about them revealed a life made up of a curious mixture of intention and abandon. If their lives were measured by possessions, there wouldn’t be much to measure. But if their lives were measured by the people they touched, a mountain would grow up behind them. While I do not know the depths of the character of these men or all the rules they chose to live by, there are some so readily apparent they can’t be missed – and equally clear that Louis lived and died by his. Louis and Everett chose to live simple material lives in order to have the time and freedom to live full recreational and relational lives. But more than that, their authenticity went beyond recreation; they were authentic in all things and their lives reflected their values. They didn’t just take from the earth, they gave back to the earth by using it with care and by walking lightly on it. This walking lightly stemmed from an ethic that required they be conscientious with how they lived, the food they ate, the materials they consumed and disposed of, how they spent their time, and how they treated people. In order to claim an ethical life they had to live it, and they did. Beyond their ethics they lived, loved, and played with abandon and invited any and all to join them. They selflessly gave their time, their expertise, and anything they had to share with the people around them. They maintained a childlike awe and wonder for the natural world and dove in head first, living life fully committed and at a dead run. They knew the risks of their activities, accepted the dangers and responsibilities, and not deterred by age, chose to live – living their lives on the razor’s edge of adventure whenever they could. At the end of the announcement that Louis was gone Everett said, “Louis would want everyone to keep getting out there and living life to the fullest.” Not surprisingly, Everett wasn’t sure if he would ever venture back into a canyon, but Louis’ call to live life to the fullest would probably have started with his life partner and husband of 21 years and as such, Everett has now bravely proclaimed that he will continue to descend the ever alluring canyons in Zion. **End Note: While no one can be blamed for this tragic accident, and people are ultimately responsible for their own safety, people who remove anchors and/or gear in canyons, thereby changing the beta significantly, and do not make it known, are increasing the risk and danger for those who come after them. Especially when the beta change results in a significant change in rappel lengths. Posted on October 25, 2015, in Profiles of the Southwest and tagged authentic living, canyoneering, canyoneering in zion, Christian Louis Johnson, dangers of canyoneering, death in Zion, ethics, having an authentic life, living an ethical life, Norse myths, Not Imlay Canyon, outdoor adventure, recreation, southern utah, Tom Jones, Wallace Stegner, Zion Naitonal Park. Bookmark the permalink. 4 Comments. I’m very grateful to have had the pleasure of descending a canyon with Louis and Everett. He was a special guy. We don’t need to elevate ourselves and our choices and our beliefs of what an authentic life looks like, or denigrate others and their choices and their beliefs, in order to live an authentic life. We can just let that stuff go. I’m hoping that’s what Louis would do. I’m glad you got to know Louis and Everett. I suppose the world “glory” illicits all kinds of things in our heads, as you say, but in my mind, it is the simple definition that means “to take great pride or pleasure in.” Authentic is authentic. This was just about people who pursue pleasure in outdoor adventure, and if you spent time with Louis and Everett, I am sure you know what I am referring to. Wonderful article, thank you Greta. I think you missed an important point in regard to published canyon information. Canyon beta is not published by guide services, it is published by enthusiasts like myself. The Park has no interest is trying to maintain an accurate description of canyons. Canyon beta is a snapshot of what the canyon is like on one particular day from one particular viewpoint. Canyon beta is obsolete, out-of-date, and inaccurate at the moment it is published. Canyon beta is helpful – but canyoneers should deal with the reality of the world in front of them. The tragedy here is that our friends gave greater weight to the beta and their memory than to what they could see in front of them. Thank you, I appreciate that. Point well taken. I do believe that people are ultimately responsible for their own safety and should come prepared for all contingencies, but what I wonder is if people are aware that canyoneering books and enthusiast websites like yours are “obsolete, out-of-date, and inaccurate the moment” they are published. Perhaps most are and I am just worrying unnecessarily. I made that comment at the end of my article as an after-thought because the anchor was missing from Not-Imlay-Canyon. We may just disagree here, but my issue is not with up to date beta, or park officials being aware of changes, so much as it is with people who remove gear. There are purists and saboteurs who do remove gear and I believe create unnecessary risk and danger for those who come behind them. It is one thing to say that you must ghost through a canyon or use natural anchors, it is another thing entirely to have information out about anchors and rappel lengths, and then show up to missing gear because someone removed it. It has happened to us. Luckily we had extra slings and gear to replace the missing anchors. I suppose it might be reasonable to tell people to come prepared to handle all of their own anchors, etc., but I think that because of enthusiasts websites and books explaining the routes, many people come expecting to find what they read about. 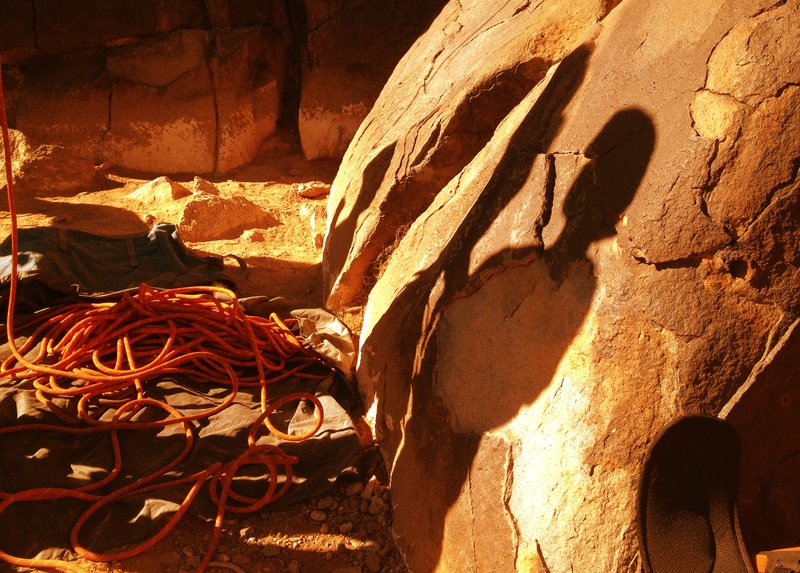 I have updated my end note to just say that I believe people who remove gear are creating unnecessary risk and danger and I hope that people, especially amateurs, are fully aware of what they face despite researching the routes they plan to canyoneer in. I think for safety reasons this is a good discussion to have. Thanks for commenting and keeping it real.